Vending machine technology is advancing across the world. Vending machines has been in use since ages starting from dispensing holy water and it has been in development phase. Technology advancement has led smart vending machines to interact with the people in terms of gesture sensing, cashless payment, NFC, voice recognition, touch panel, and a lot more. It has a huge market base in U.S. owing to consumption and spending habits. Smart vending machines are not so common to use as compared to existing vending machines, yet it has a huge potential to replace the existing vending machines on account of extensive use of technology by way of internet, mobile phones and other online platforms. Goldstein Research analyst forecast the global smart vending machines market size to reach USD 11.15 billion by 2024, at a CAGR of 37.6% over the forecast years. The report covers the present ground scenario and the future growth prospects of the smart vending machines market for 2016-2024 and shipments of vending machines worldwide to various end users. We have calculated the market size and revenue share on the basis of revenue generated from major players and their sales of smart vending machines across the globe. On the basis of product type, beverages hold the largest market share i.e. 37.1% in global smart vending machines market owing to its higher consumption. Also the tickets specialized smart vending machines are the next one gaining importance in terms of its quick and user friendly technology. Smart vending machines market Outlook 2016-2024, has been prepared based on an in-depth market analysis from industry experts. 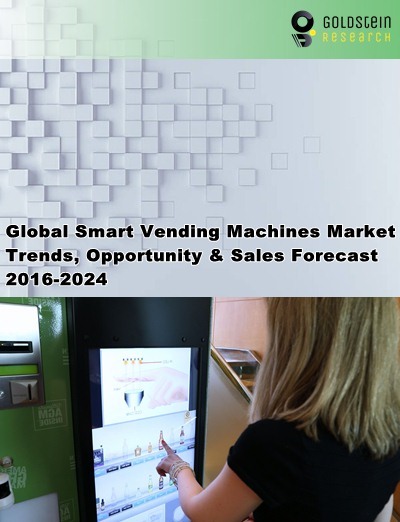 The report covers the competitive landscape and current position of major players in the global smart vending machines market. The report also includes porter’s five force model, SWOT analysis, company profiling, business strategies of market players and their business models. Global smart vending machines market report also recognizes value chain analysis to understand the cost differentiation to provide competitive advantage to the existing and new entry players. According to our global market study on the basis of extensive primary and secondary research: There has been an increasing trend of developing software for sending and receiving information like custom requests, quality products on demand. The use of NFC is also high on demand so as to make cashless transactions easier. According to the report, major driving factor for expansion of smart vending machines market are the opportunities enabled by smartphones to make payments, interaction of machine to customer and its mobile for knowing product information and high graphics display of products, and detecting individual response. Further, the major challenge this industry is facing is to integrate government protocols and standards while incorporating new technologies. One of the mandates is lower energy consumption, which has led to high cost in installing energy efficient machines. Based on geography, North America dominates the smart vending machines market with almost 2/5th market share in 2016, due to the higher use of mobile phones and internet. U.S. infrastructure is well equipped with LCD’s, cashless system and telemetry system which facilitates its adaptation in this changing scenario, from a vending machine to a smart vending machine. Our global smart vending machines market report comprises of the following companies as the key players in the smart vending machines market: N&W Global Vending S.p.A., Cantaloupe Systems, Seaga, Fas International, Rhea Vendors Group, Azkoyen Group, Sielaff GmbH & Co. KG, BIANCHI INDUSTRY S.p.A, Jofemar Corporation, Continental Vending Inc.
Other high-flying vendors in the smart vending machines market are: Automatic Vending Specialist, Crane Merchandising Systems, Sanden, Royal Vendors, Bianchi Vending, Deutsche Wurlitzer, TCN Vending Machine, Fuhong Vending. What is the revenue of smart vending machines market in 2015-16 and what would be the expected demand over the forecasted period?